Welcome to the UCHealth family! All of us at UCHealth are very proud to have you join us. Here are a few important tools as you start your journey. Prior to your orientation, we ask that you complete new hire paperwork based on the hospital or clinic location where you will be working (see headings below). Please be sure to have Adobe Acrobat Reader installed to assist with electronic paperwork completion. Get the most recent version of Adobe Reader. The UCHealth Benefits page is password-protected. To enter, please use the password provided under the “Benefit Programs” section of your offer letter. Questions? Please call UCHealth Human Resources: 720.848.6800. With award-winning hospitals and facilities serving the entire Front Range of Colorado and beyond, UCHealth is the state’s largest and most innovative health system. We look forward to having you join our award-winning team! If your position is benefits-eligible, please review information available on the UCHealth Benefits page. Please view/download this Frequently Asked Questions document as you review new hire paperwork requirements. We look forward to having you join our award-winning team at Memorial Hospital, Grandview Hospital or UCHealth Medical Group. Prior to orientation, we ask that you complete the paperwork and steps listed below. There are 7 steps to the new hire process that must be completed. Click on the links for more information on each step. Please note: all steps must be completed by the Wednesday prior to your orientation date, or your start date may be deferred. Please read through all steps, as you may be able to complete most of them on the same day as the health screen appointment. Please contact Employee Health as soon as possible to schedule your onsite health screening. Employee health may be contacted at 720-848.6849 or by emailing you request to uch.employeehealth@uchealth.org. Please allow 24 business hours for a return call if you leave a voicemail message. This appointment, which must be completed by the Wednesday before your orientation date, includes a drug screen, immunization review, lab draw, TB test, biometric screening, vision test for color deficiency, vision screening, and a respirator fit test, as based on your job title/location. Fasting for at least 8 hours prior to your appointment will provide the most accurate biometric screening results. Lab titers, immunization records, influenza vaccine documentation during flu season (September – April) and tuberculosis testing results. Please come to your appointment even if you do not have this requested documentation. Come well hydrated to your appointment (urine and blood specimens will be collected). Any positive urine drug screens are sent to an external lab for verification, a process that requires extra time (which could delay your first day of employment for at least two weeks). NOT DENY EMPLOYMENT OPPORTUNITIES TO AN APPLICANT OR EMPLOYEE BASED ON THE NEED TO MAKE A REASONABLE ACCOMMODATION RELATED TO THE APPLICANT’S OR EMPLOYEE’S PREGNANCY, PHYSICAL RECOVERY FROM CHILDBIRTH, OR A RELATED CONDITION; NOT REQUIRE AN APPLICANT OR EMPLOYEE AFFECTED BY PREGNANCY, PHYSICAL RECOVERY FROM CHILDBIRTH, OR A RELATED CONDITION TO ACCEPT AN ACCOMMODATION THAT THE APPLICANT OR EMPLOYEE HAS NOT REQUESTED OR AN ACCOMMODATION THAT IS UNNECESSARY FOR THE APPLICANT OR EMPLOYEE TO PERFORM THE ESSENTIAL FUNCTIONS OF THE JOB; AND NOT REQUIRE AN EMPLOYEE TO TAKE LEAVE IF THE EMPLOYER CAN PROVIDE ANOTHER REASONABLE ACCOMMODATION FOR THE EMPLOYEE’S PREGNANCY, PHYSICAL RECOVERY FROM CHILDBIRTH, OR RELATED CONDITION. New hires will receive an email from Universal Background Screening company. This email will be sent out within 48 business hours after your job offer or 30 days out from your start date, whichever date is later. This email will include a link to a form requesting some data points as well as an electronic signature. This allows UCHealth to run the required background check as part of our pre-employment process. WITHOUT completing this step, a background check will NOT be initiated and may result in a deferral of your start date. Please check for this email and complete it ASAP. Also, check your Junk/Spam folders if you do not receive the email. Click here to complete Section 1 of the I-9 Employment Eligibility Form. This online section must be completed by your first day of employment. Your employment date on the form will be your first day of paid employment, which is the Monday of orientation week. State and federal regulations mandate that prospective employees produce documents that establish their identity and eligibility to work in the United States. There is a step two to the I9 process. Bring either 1) one “List A Document” OR 2) one “List B Document” AND one “List C Document”. You will need to bring these original documents (no copies or expired documents) to Human Resources when you come in for your health and drug screen. View the list of acceptable documents. Failure to bring any of these documents and not providing the original document by the end of business day on the third day following your orientation date (72 hours) will lead to termination of employment. Required documents to submit to a Recruitment Coordinator prior to the pre-employment deadline (the Wednesday prior to your start date). The documents listed below should be uploaded to the UCHealth pre-employment app that you can login to via the email you will receive from UCHealth prior to your start date after acceptance of the offer. If your start date is more than 45 days out, this email will be sent at the 45 day mark. Please enter your name, and NEO date in the subject line. Certifications/Licenses: If a certification or license is required for your position, please send it to the appropriate email address above. All certifications must be current through the first 60 days of hire. If your certification is expiring, it is your responsibility to get it renewed and have a new card in hand by the Wednesday deadline prior to your NEO. If required for your job, BLS cards must be through the American Heart Association or the American Red Cross CPR for the Professional Rescuer. Please send a copy of your card to a Recruitment Coordinator at the email or fax listed above. Your BLS or CPR card cannot expire within sixty days of your start date. (American Red Cross CPR for the Professional Rescuer is only good upon hire and all renewals will need to be through an American Heart Association sanctioned course. )Please review the examples of cards and please make sure you meet these requirements. If not, please notify your recruiter immediately or it could delay your start date.Send all other required documentation (i.e. RN license, clinician license, etc.) to the email or fax listed above prior to your deadline. Education verification: Please provide a copy of your highest level degree diploma or final transcript, as listed in your job description. We will verify your education directly with the school, however a copy may help to expedite the process. Your job description will be emailed to you. Please print, sign, and return this document to the onboarding email address listed above prior to your Wednesday deadline. License Plate Number: Please bring license plate numbers for any vehicles you plan to drive to work, so that you can use that information to fill out your parking registration form either in HR or at the badging office. Please note any delay in completing this paperwork may result in deferring your scheduled start date. During your visit to Human Resources at 2420 East Pikes Peak Avenue, you will have your badge picture taken at the Employee Badging Office (located in HR). You will be asked to show identification such as a driver’s license before the badging staff member takes your picture. Your picture will be stored until your orientation date, at which time your employee badge will be delivered to your orientation session. Below are details that will help you experience a great new employee orientation. Orientation is scheduled for your first day, from 8 a.m. – 4:30 p.m.. Please arrive up to 30 minutes early to check in and get settled before the 8 a.m. start time. Where: Memorial Administrative Center (MAC), located at 2420 E. Pikes Peak Avenue in the Cuchara room. A full breakfast and lunch will be provided. Please park in any available employee parking at the MAC (spots that are not designated as visitor/guest). If your position requires scrubs, you will be sent an email from Medline (suitestyles@medline.com) to your personal email address provided on your application, after hire. This email might end up in your junk or spam folder. For any scrubs needs prior to receiving your order, please refer to Human Resources staff while completing your HR paperwork requirements. Click here to download a printable version of the checklist. We look forward to having you join our award-winning team at University of Colorado Hospital, or at one of our other metro Denver facilities. Prior to orientation, we ask that you complete the paperwork and steps listed below. There are 8 steps to the new hire process that must be completed. Below you will find needed information to help with the rest of your onboarding experience as it relates to Employee Health. PLEASE COMPLETE, AND BRING WITH YOU TO YOUR EMPLOYEE HEALTH APPOINTMENT, ALL DOCUMENTS ATTACHED TO THIS EMAIL AND EVERYTHING LISTED BELOW. Ensure you have reviewed all needed Human Resources steps (on this site) prior to coming into your Employee Health appointment. Email your immunization records to uch.employeehealth@uchealth.org prior to your appointment date. Some immunizations may be required prior to starting at UCHealth. Please contact Employee Health as soon as possible to schedule your onsite health screening. Employee health may be contacted at 720-848.6849 or by emailing your request to uch.employeehealth@uchealth.org. Please allow 24 business hours for a return call if you leave a voicemail message. If you have an appointment after April 10, 2017, please go to the security desk on the 1st floor of the Leprino building and ask for a temporary badge to come to Employee Health. A badge is required to access the 7th floor, where Employee Health is located. If you haven’t received your onboarding email yet, remember to bring two forms of ID (driver’s license, social security card, passport, Military ID, etc.) along with your Job Description – HR will need this information for process. Walk to the Leprino lobby, and then check in as a visitor at the Security desk to receive a temporary badge before taking the elevator to the 7th floor. Please review the examples of cards and please make sure you meet these requirements. If not, please notify your recruiter immediately or it could delay your start date.Send all other required documentation (i.e. RN license, clinician license, etc.) to the email or fax listed above prior to your deadline. We will take your picture for your employee badge when you come to Human Resources to provide your I-9 identification documents. Below are details that will help you experience a great new employee orientation. Orientation is scheduled for your first day, from 8 a.m. – 4:30 p.m. Please arrive up to 30 minutes early to check in and get settled before the 8 a.m. start time. Where: Orientation is typically held at the Leprino Building, Room 617 (directly across from Human Resources on the 6th floor), 12401 E. 17th Avenue, Aurora, CO 80045. On the first day of orientation, please park in the Capri parking lot, which is an open surface lot located at the intersection of Ursula Street and East Colfax Avenue. To access the lot, please look for a PIN code that will be emailed to you the Friday before your orientation. Attendants will be there to give you access to the lot if needed. 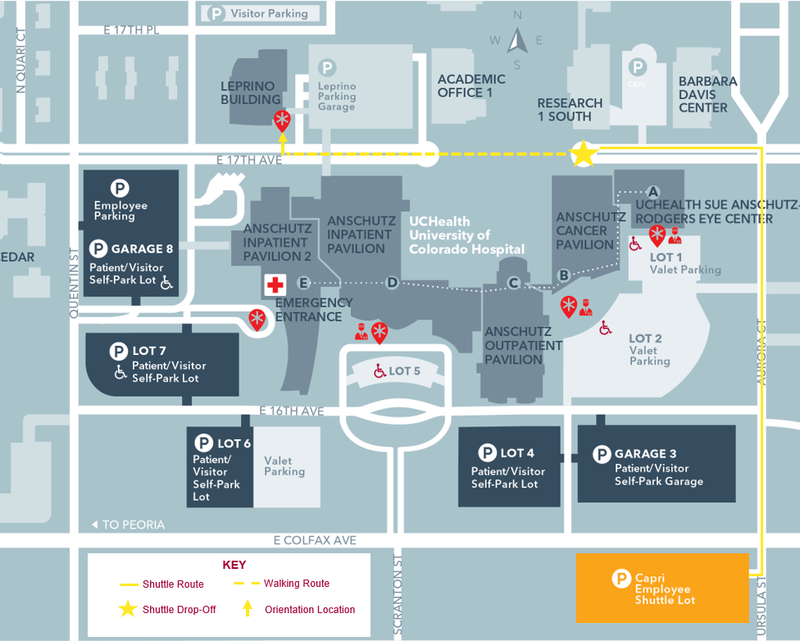 Please take the shuttle to the drop-off point in front of the Anschutz Cancer Pavilion. From there, your orientation is a short walk over to the Leprino Building. In the afternoon, you will take the shuttle back to your car. Please do not park in the visitor pay parking area in the Leprino Parking Garage at 17th Avenue and Quentin (where you may have parked for your interview). You will only have access to park in the Capri Lot. You will learn more about employee parking on campus during orientation, including your assigned parking location and parking rates. The Capri lot will have shuttle service 24 hours a day from 3:30 a.m. on Mondays until 4:00 a.m. on Saturdays. There will be a security guard present at this lot during these hours as well. On weekends, you will be able to park in Garage 8 beginning at 5:30 p.m. on Fridays until 7:30 a.m. on Mondays. This weekend parking will not be charged the $2 daily rate. If your position requires scrubs, you will be sent an email from Medline (suitestyles@medline.com) to your personal email address provided on your application, after hire. For any scrubs needs prior to receiving your order, please refer to Employee Health staff during your health and drug screen appointment for information on UCHealth’s Loaned Scrubs Program. We look forward to having you join our award-winning team at Poudre Valley Hospital, Medical Center of the Rockies, Longs Peak Hospital or UCHealth Medical Group. Prior to orientation, we ask that you complete the paperwork and steps listed below. There are 8 steps to the new hire process that must be completed. Click on the links at the left for more information on each step. Lab titers, immunization records and tuberculosis documentation. Please come to your appointment even if you do not have this requested documentation. Human Resources (HR) and Employee Health are located in the same office, so please provide the acceptable documents to complete the I9 process (see Step 4: Employment Eligibility – HR Office) as well as the make, model, and license plate number of your vehicle(s). In addition, if unable to submit any of the required HR documents electronically, please bring them with you to your appointment. Walk in the main entrance of Medical Center of the Rockies and you will see a hallway immediately to your left. Walk down that hallway, take your first right and Human Resources Services is the second door down on the right hand side of the hallway. Walk in the main entrance of Longs Peak Hospital, turn right, walk past the gift shop and pharmacy, turn left down the hallway, and the HR office is located on the right side. Certifications/Licenses: If a certification or license is required for your position, please send it to the appropriate email address above.All certifications must be current through the first 60 days of hire. If your certification is expiring, it is your responsibility to get it renewed and have a new card in hand by the Wednesday deadline prior to your NEO. Please provide a copy of your highest level degree diploma or final transcript, as listed in your job description. We will verify your education directly with the school, however a copy may help to expedite the process. Please bring license plate numbers for any vehicles you plan to drive to work, so that you can use that information to fill out your parking registration form either in HR or at the badging office. Please note any delay in completing this paperwork may results in deferring your scheduled start date. Where: Medical Center of the Rockies (MCR), 2500 Rocky Mountain Avenue, Loveland, in the Longs Peak meeting room (in the basement). Please approach the hospital from the west main entrance, and park in the New Employee Parking area. Parking is designated by the red flag on the left as you enter the campus. On day one, instead of New Employee Orientation listed above, you will arrive at Harmony Surgery Center. The leadership team will send you the schedule and details. We look forward to having you join our award-winning team at Yampa Valley Medical Center. Prior to orientation, we ask that you complete the paperwork and steps listed below. You will need to contact UCHealth Occupational Medicine Clinic shortly after your offer to schedule your pre-employment appointment. Please contact Meg Montgomery, Occupational Employee Health Nurse RN at 970.875.2749 to schedule your appointment. Plan for the appointment to take at least 60 minutes. This appointment must be completed by the Wednesday before your orientation dates. It includes a drug screen, immunization review, lab draw, TB test, biometric screening, vision test for color deficiency (if applicable), respirator fit test as based on your title/location and flu test (during flu season). Fasting for at least 8 hours prior to your appointment will provide the most accurate biometric screening results. Documentation of any past positive TB screening in your lifetime. Documentation of any past chest X-ray related to a TB screening in your lifetime. New hires will receive an email from the Recruiter. This email will be sent out within 48 hours after your job offer or 30 days out from your start date, whichever date is later. This email will include a date this is required to be completed and a link to a form requesting some data points as well as an electronic signature. This link is a link to PreCheck. This allows UCHealth Yampa Valley Medical Center to run the required background check as part of our pre-employment process. There is a step two to the I-9 process. Bring either 1) one “List A Document” OR 2) one “List B Document” AND one “List C Document”. You will need to bring these original documents (no copies or expired documents) to Human Resources on your start date. View the list of acceptable documents. Failure to bring any of these documents and not providing the original document within 72 hours of your orientation date will lead to termination of employment. Certifications/Licenses: If a certification or license is required for your position, please send it to the appropriate email address listed above. If required for your job, BLS cards must be the American Heart Association or the American Red Cross CPR for the Professional Rescuer. Please send a copy of your card to your Recruiter at the email listed above. (American Red Cross CPR for the Professional Rescuer is only good upon hire and all renewals will need to be through an American Heart Association sanctioned course.) Please review the examples of cards and please make sure you meet these requirements. If not, please notify your recruiter immediately or it could delay your start date. Send all other required documentation (i.e. RN license, clinician license, etc.) to the email listed above prior to your deadline. Please provide a copy of your highest level of education degree diploma or final transcript, as listed in your job description. We will verify your education directly with the school; however a copy may help to expedite the process. Please bring license plate numbers for any vehicles you plan to drive to work so that you can use that information to fill out your parking registration form in HR on your start date. Please note: Any delay in providing the documents above may result in deferring your scheduled start date. Below are details that will help you experience a great new employee orientation. Orientation is scheduled for your first day, from 8:00 am to 4:30 pm. Where: UCHealth Yampa Valley Medical Center, 1024 Central Park Drive, Steamboat Springs, in Conference Room 1 (this is subject to change). You will also receive an email on late Thursday afternoon prior to your start date reminding you of your Orientation/Start date and providing you the correct conference room number. A light breakfast and a catered lunch will be provided. Wear business casual clothes to orientation. Please note: If you are not dressed appropriately, you will be asked to go home and change. On the first day of orientation, please park in designated employee parking. A map will be attached in your Thursday email reminding you of your Orientation/Start Date. You will receive a parking permit with on your Orientation/Start Date. This will need to be installed on the outside of your vehicle in the lower left corner of the rear window. We will take your picture for your employee badge at orientation. Your employee badge will be delivered to your orientation session before end of day. New hire paperwork will be provided to you on your start day and upon your arrival for Orientation. All paperwork must be complete and turned into HR by end of Orientation. View/download a printable version of the checklist.